Interested in History? Join your friends and neighbors by giving a few hours each month to work at the front desk, lead tours, assist with educational programming, or help with special events. Your time helps us remain open seven days a week and is invaluable to us! Contact Gloria Cooper, Education Coordinator, at 540-829-1749 if you are interested in volunteering! 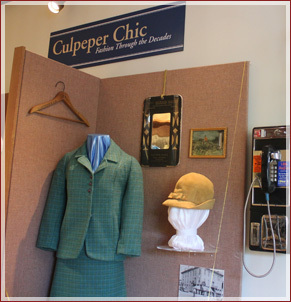 The Museum regularly changes its exhibits which feature a variety of topics that illuminate the rich history of Culpeper. In order for us to create exhibits, we often seek loans or donations of objects, documents and artifacts from residents that relate to these topics. You can support the Museum with monetary contributions or in-kind donations like goods and services. The Museum is a non-profit 501(c)3 organization, and all gifts are tax-deductible. Join the Friends of the Museum, the Heritage Cabinet, or give a one-time donation.